NEW LONDON - Although stained glass artist Marsha Abrahamson has had some high-profile clients, her latest venture is more of a mom and pop store. The artist ("I'm not a craftsman"), who helped designed a large wildlife scene and 2,000 other windows at Foxwoods, opened a retail outlet called Vasiloff Stained Glass at 471 Colman St. for both her own and imported stained glasswork. 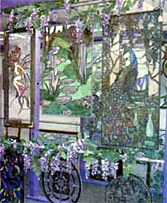 Previously, Abrahamson operated her business out of her Old Lyme home, where she has a studio. "I've always wanted to try the retail end of things," she said. The shop's interior, with its ornate stock of windows and Tiffany lamps, belies the drab aluminum building that Abrahamson began renting in March. Though she admits it's "not the perfect setting," Abrahamson said she wanted to offer her customers plenty of parking. She said she likes to sell her own work at the shop, but has begun selling lamps made in China because of the cost. "It helps maintain low prices," she said. 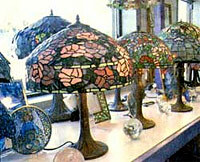 Abrahamson said the lamps range in price from $50 to $180, while the windows can run up to $450. "The (Tiffany-style) lamps create a focal point for a room," she said. "They are definitely popular." However, Abrahamson said the lamps are more of a "sideline" for her, as she prefers to focus on windows. In addition to her commissioned work for Foxwoods, Abrahamson said she still spends the majority of her time working on custom windows. "I just did a boat scene," she said. Predictably, nautical themes dominate in the area, but she also has worked on the restoration of church windows and has even designed a window for a privately owned school bus. And roosters. "A person once wanted a window of their rooster," she said. Since then, Abrahamson has created four or five other rooster windows. "I'll do anything," she said, with a laugh. "I've had a lot of fun with some of the designs." Though she has a medical assistant's degree, Abrahamson has been working with stained glass since 1973. She said she was first drawn to the medium while she was working at the Chapman House lamp factory in Old Saybrook. "It was mesmerizing," she said. "Seeing the light coming through the glass. It can affect your mood." Sue Corrigan, manager at Cherrystones Restaurant in Old Lyme said the three dimensional piece Abrahamson did for them draws compliments almost daily. "It sets a tone for the room," she said. "She's family friend and we wish her well with her business." Abrahamson said she is inspired by both the natural and fantastical world, as several of her windows depict fairies and other figures from folklore. "I enjoy fantasy art," she said. "I like to go to the Renaissance fairs." Yet Abrahamson, who also has work on display at the Britt Gallery in Old Lyme, considers stained glass work "a dying art." Part of the reason, she explained, is that the process is time-consuming and because a log of the work can be done cheaper overseas. "You have to have the love of this in your heart," she said, adding, "I know I'll never leave stained glass." Abrahamson's two children, now both in their 20s, help her out from time to time. "It's very important to have the support of your family if you own a small business," she said. As far as the future of Vasiloff Stained Glass, Abrahamson said she is going to "see how it goes." "These are the kinds of gifts I like to be surrounded by," she said. "It's stuff you can't get at the Crystal Mall."